Just as this post said, sometimes, we will have problem in managing our audio files, like M4A audio. In order to make uploading, storing and sharing easily, a professional M4A splitter is necessary. By utilizing such a practical tool, you can strip any unwanted parts from original file. In addition, you can get more choices to save a new file with other format, which is more compatible with your device. Intending to show attentive workaround to this post, we are going to show you how to split M4A files into separate parts. 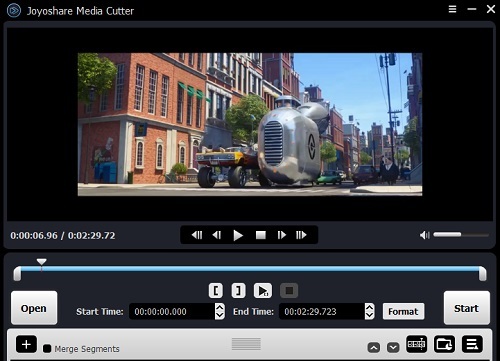 Assisting you to split M4A files offline, Joyoshare Media Cutter is regarded as one of the most competitive croppers. It provides all-round solutions to carry out cutting process without requiring any audio files uploading. You can deal with any audio track if you need, not just confined to M4A files. Alternatively, Joyoshare M4A Splitter has ability to help you choose trimming portions accurately. This full-featured tool also offers convenience to output destination files as any format, like FLAC, AIFF, WMA, AU, MP3, M4A, AAC, AC3, etc. Aside from output format, you are empowered to customize quality, codec, size, etc, as well. Joyoshare M4A Cutter can keep lossless quality for you. What's more, it is capable of conducting any task at up to 60X faster speed. Comprehensively, you can also apply this tool to manage your video files. Extract audio track from the original video or join several segments into a new one. 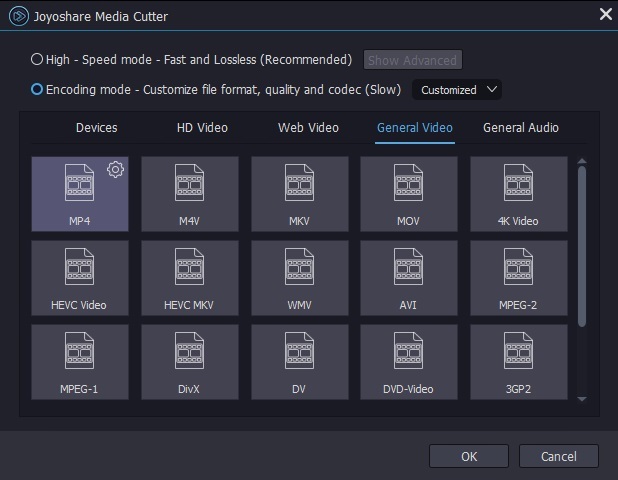 You can firmly control every spot considering Joyoshare Media Cutter will show a precise timeline and play your MA4 audio clearly. As long as you have already equipped your computer with Joyoshare M4A Splitter, you can directly launch it by double clicking the icon on your desktop. The dispensable step is to add required M4A audio file to this program. You can get two workable accesses to do it. One is to click the "Open" button to search your M4A audio from the local folder. 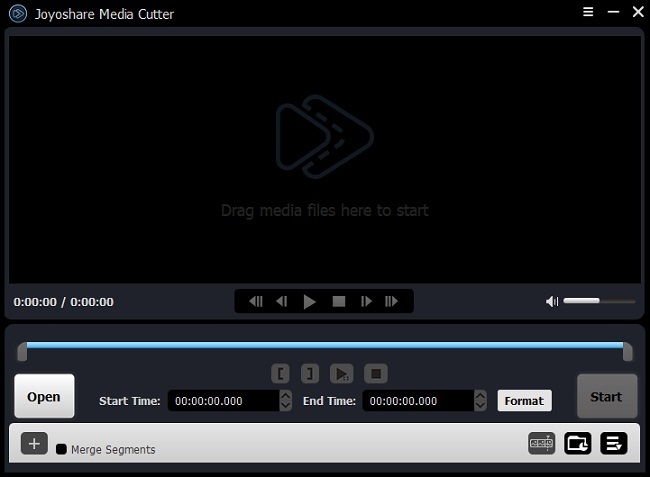 While the other is straightly drag and drop the designated M4A file to Joyoshare Media Cutter. Note that if the size of your media file is too large, the first method is better. Note: You can only add one M4A file to Joyoshare Media Cutter each time. In other words, it is not supportable to process M4A audios in batch. To make the selected cutting range as precise as possible, Joyoshare M4A Cutter is well designed with thoughtful timeline and slider. You can simply move the beginning handle and end handle to locate an exact point. Don't worry. This smart tool can automatically play your M4A audio so that you can grasp every second clearly. Moreover, you can also enter specific start time and end time to set a temporal interval in your way. Note: Joyoshare Media Cutter can do well in merging different fragments into a new one as well. What you need to do is to hit the "+" button to generate more than one segments. Meanwhile, you have right to change the temporal intervals according to your needs. After you tick the "Merge Segments" option, you can press "Start" to get the combined file. Once you have decided a trimming selection, you can continue to press the "Format" panel to set up relevant cutting options. There are a wide variety of output formats you can pick up, such as MP3, M4A, AAC, AC3, OGG, AIFF, WAV, WMA, M4B, MKA, etc. Depending on your preference, you are allowed to switch distinct modes, including "High-speed mode" and "Encoding mode". The former one can accomplish with fast and lossless performance while the latter enables you to customize quality, codec, size, etc. Now, you can set out to hit the "Start" button to let Joyoshare M4A Splitter work for you. With few seconds, you can get what you want. From the pop-up local folder, you will see all destination audio files. Play them one by one to check whether it is qualified. If not, delete the imperfect one as you like. Of course, you can repeat above operation to produce more manageable files.